Does a Man's Perspective of Women Effect How They Lead? I remember summers ago watching a live broadcast when President Clinton admitted to his sexual scandal, sitting around a family dinner of chips and tacos during a summer trip in Maine. Odd combination, Maine, Mexican food and political scandals, but it’s what I remember. “Indeed I did have a relationship with Ms. Lewinsky that was not appropriate. In fact, it was wrong.” It was an unforgettable viewing for most of us. Though Clinton’s reputation upon his impeachment still held up (if not more so after than before, and likely due to his public statement of confession) he did not continue to lead us for the obvious reasons. Clearly the man had to step down, work on his marriage and leave the spotlight, not asking anything of the public for some time to pull his life back together. He was deemed as not fit to lead our Nation. He had to get back to the basics, like leading his own household. We all know this definitely wasn’t the first of sexual scandals among our Nation’s “fearless leaders” but it certainly was the most publicized and televised in history. It would be nice if it could stay that way, but with the recent revealings (no pun intended) of Anthony Weiner’s appalling behavior flooding the media, who’s to say it’s the last of it. Anthony Weiner returned in the race to run for Mayor of New York City this year, after his supposed “therapy” and break from his sexual addictions. However stepping back into the race for Mayor has revealed his sexual scandals and explicit behavior, showing more of Anthony Weiner (or Carlos Danger, or what have you) than we ever bargained for. 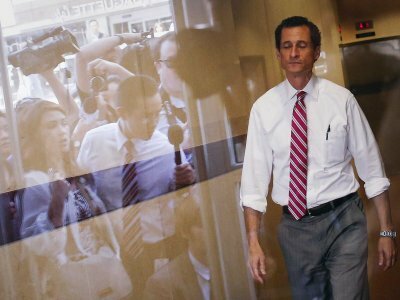 After disturbing images and texts were found of Weiner (the name alone … sorry, I digress) his campaign has come crumbling down again. His polls have dropped, he’s lost his campaign manager (at least, the one we know of) and even the media’s support, who was eager to highlight the politician in a unbiased and redemptive light, they too have lost their faith in what seemed a hopeful leader. Though I’m sure the media doesn’t mind a good political scandal all too much, and neither does late night television. Could a city really see a man with a history of such sexual struggles and disturbing addictions as fit to lead? After receiving so much support to jump back into the race and so quickly after his last falling out, one has to wonder what weight (if any) we hold to a man’s sexual activity, and view of women, as whether he is fit to lead a city, a nation or any vicinity of our government for that matter. Anthony’s foolish activities are just a grade below the kind of behavior you’d expect of a faithless husband and more like something of an airhead frat boy. Then again, who’s to say one differs all that much from the other in these situations. What was already known of Anthony was just that: foolish, frat boy frivolity with a clear contempt for women, and lack of any ability to serve them as citizens, let alone hold them up (them meaning his wife, his daughters and the many women who encountered him ) with any basic human respect. Could a man who would so easily and so often use women just for the momentary rush, while their wives at home have seemed to have lost their attention (because in these situation they always seem to be married), possibly lead anyone with clarity and dignity? How can a full grown man who so easily falls into these self-destructive patterns conduct himself as a leader? What aspect of this character would anyone want leading them? The stage for a politician these days is shared with the stage of celebrity. In the sense that they are spotlighted, praised and put on a pedestal when we don’t always have reason except for the beautiful performances that first inspire us from our screens. Even still, when a man’s view of a woman become so routinely objective there are deeper issues rooted than one year of “therapy” can clear out. The conduct and sexual habits of a man no doubt carry a ripple effect into the lives they lead. Hopefully in the future we’ll take such conduct and behavior into more consideration before they’re even in the run to begin with.